We are at AdTech 2016, come; meet us to talk digital! 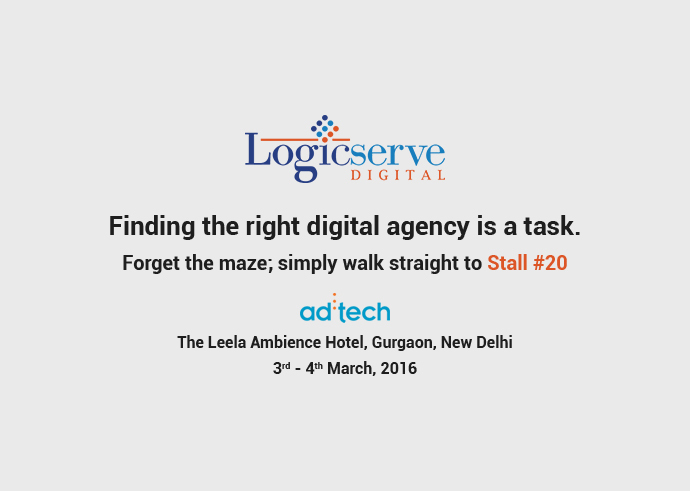 Digital marketing space is getting together for one of the biggest digital conferences in the country, Ad: Tech 2016.Logicserve Digital is excited to attend it and be a part of generating meaningful conversations and being in tandem with the trends that 2016 has to offer for changing the digital media landscape. It’s 2016, and that time of the year when the whole digital marketing space is getting together for one of the biggest digital conferences in the country, Ad:Tech 2016. We, at Logicserve Digital, are excited to attend it and be a part of generating meaningful conversations and being in tandem with the trends that 2016 has to offer for changing the digital media landscape. Logicserve Digital is an integrated Digital Media Planning and Buying agency, with expertise in understanding our clients’ business challenges and providing customised solutions to help them achieve their goals. We believe that the apt usage of technology and continuous measurement form the pillars of digital marketing. Being at Ad:Tech will give us the opportunity to connect with great minds and exchange great ideas on Digital Marketing. Our team is here at the conference, to discuss ideas, learn about innovations and be a part of conversations on the way digital marketing is growing. So, come visit us at Booth #20! The knowledge exchange will be imperative for creating connections and collaborations that will enable us to make optimum use of digital marketing trends. The insights that will be shared by the keynote speakers who are one of the brightest and the best minds in the digital marketing space will support with identifying new trends and the way ahead for growth. Maanesh Vasudeo, Director, Client Servicing – Has worked on 360-degree award-winning campaigns with a multi-channel approach across multiple platforms. Also has sound understanding of how Paid, Owned, Earned and Technology be leveraged as an integrated solution. Ashish Duggal, Sr. Manager, Business Alliance – Is a solution provider for the client’s requirements on digital media campaigns. He specialises in media planning and buying. His expertise also includes driving focussed ROI campaigns. Sudeshna Chakravarty, Assistant Manager, Business Alliance – Manages end to end execution and co-ordination of 360-degree digital marketing campaigns with a solution based approach to meet the client requirements. Inauguration – Opening Keynote presentation by Michael Chrisment, Global Head of Integrated Marketing, NESCAFÉ, Nestlé. Using Technology to create “IN THE MOMENT” Marketing – Will talk about how brands should embrace this phenomenon to enhance conversions. Beyond shares, likes & comments: Measuring the true value of content – What stats are meaningful for understanding the value of content. Full-Funnel Content Marketing: Leveraging Content To Move Audiences Down The Funnel – How content can effectively complete a brand’s story. With 5,000 plus attendees from over 28 countries, this conference will provide every digital marketer or a branding professional with various opportunities to explore their avenues. So drop by at booth #20 if you are at Ad:Tech 2016. Kindly fill in your details here. #USElection2016 – What intent marketing showed that polls got wrong?